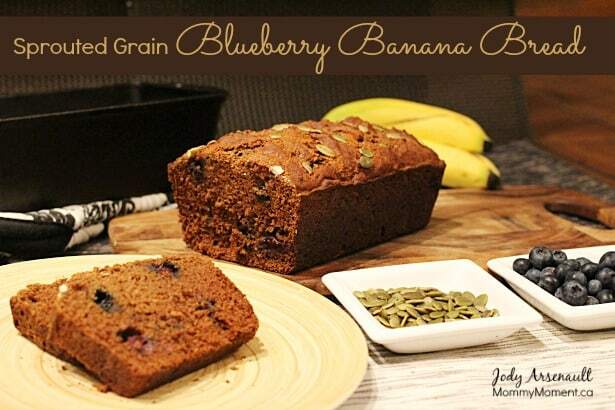 I had a lot of fun creating the recipe for this sprouted grain blueberry banana bread recipe. 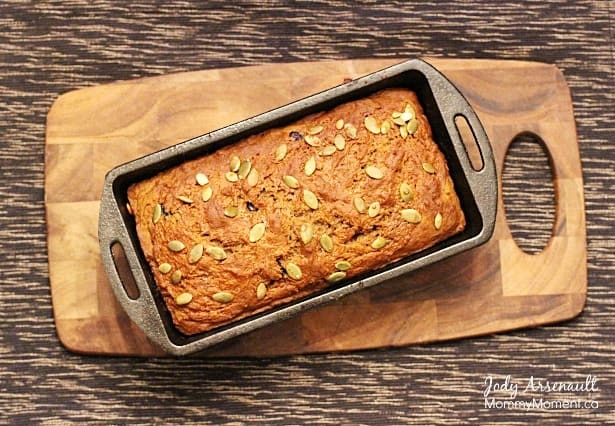 This is a healthy banana bread that is refined sugar free! Did you know that February 23 is National Banana Bread Day? I have also been working very hard to take beautiful photos to share along with my recipes. I am no professional, but I hope you are enjoying them. 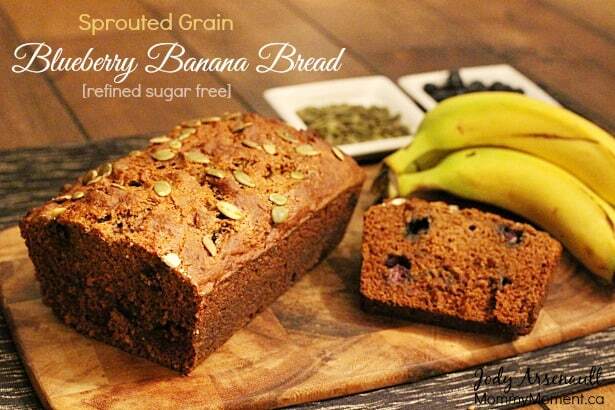 This healthy sprouted grain blueberry banana bread is free of refined sugars and tastes delicious! Put first 4 ingredients and 2 of the 3 bananas into a blender (I use a vitamix). In a separate bowl mix together the dry ingredients (flour, salt, baking powder and baking soda). Mix the dry ingredients with the blended ingredients then add in the last banana (mashed). Carefully stir the blueberries in. Pour mixture into a greased loaf pan (I used cast iron) and sprinkle the pumpkin seeds (and maple syrup if desired) on top. This recipe was loved by our whole family. My daughters had friends over and they all loved it too! You can sign-up to get an email update each day. Connect with us on Pinterest and Instagram. Wow this bread looks so delicious! I love the addition of the dates for sweetness – so healthy and yummy! Pinning this! Thanks so much Jo-Anna. You would never know there are dates in it, but I really think it gives it the perfect touch of sweetness. Thanks for your comment, and thanks so much for pinning! Soooo impressed! It looks amazing and I bet it tastes like heaven!!!!! Thanks Kristen! I’m happy that I am learning to come up with healthy, real food recipes. It’s always a bonus when the whole family loves them. Looks amazing! I love that you didn’t use any extra sugar. Where do you buy the flour? Thanks Stacie! We do not eat refined sugar anymore so I have to be creative when making recipes. I bought my organic sprouted grain flour at Costco – They just starting carrying it at the location I shop at. Thank you so much for sharing this recipe! I am dying to try this out! I can’t wait to try this just because it has no refined sugar in it…that’s amazing! Thanks for the recipe Jodi i am always looking for healthier snacks and treats for my family! I am a HUGE fan of Banana bread and blueberries! Put them together and I get BLISS!!! I absolutely love banana bread. Thanks for the recipe. looks good, does it need the pink himalayan sea salt? I love that this recipe does NOT include sugar. The banana’s, dates and maple syrup are a much wiser choice. The recipe sounds divine. 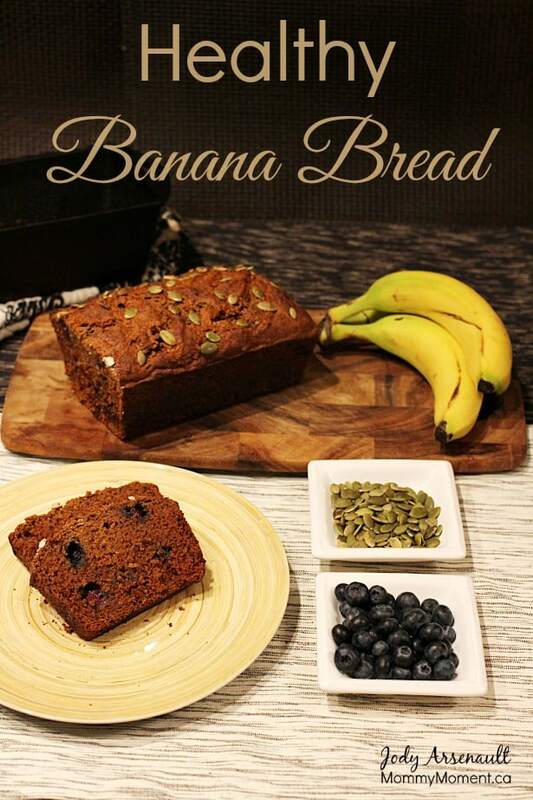 looks super yum – I love pumpkin seeds, blueberries and bananas…can’t wait to try! This sounds absolutely delicious! The ingredient list is wonderful! Would it work with regular table salt? You are so wonderful! I was wanting to make blueberry banana bread and voila! There you have a fabulous recipe all posted up there! Thank you – for sure will try this one out. You’re better than google. What an awesome and healthy recipe! I love the pumpkin seeds on top, they look so pretty! This looks super good! I have a bunch of friends that have started buying sprouted grains and they make delicious foods with them. I’m tempted to start bringing them into my cooking too. Do you use coconut sugar at all or is it a refined sugar too? I do have coconut sugar in my house, but I honestly rarely use it. I try to stick to dates, pure maple syrup and honey as my first choices. I do think that coconut sugar is a great alternative to white or brown sugar though! Great recipe. Can’t wait to try it! This looks so good. I can not wait to try it! This looks delicious! Reading through the ingredients, everything looks so healthy and nutritious. I had planned on baking Banana Bread using my usual recipe but I already have several of the ingredients for this one. Great twist on this recipe.